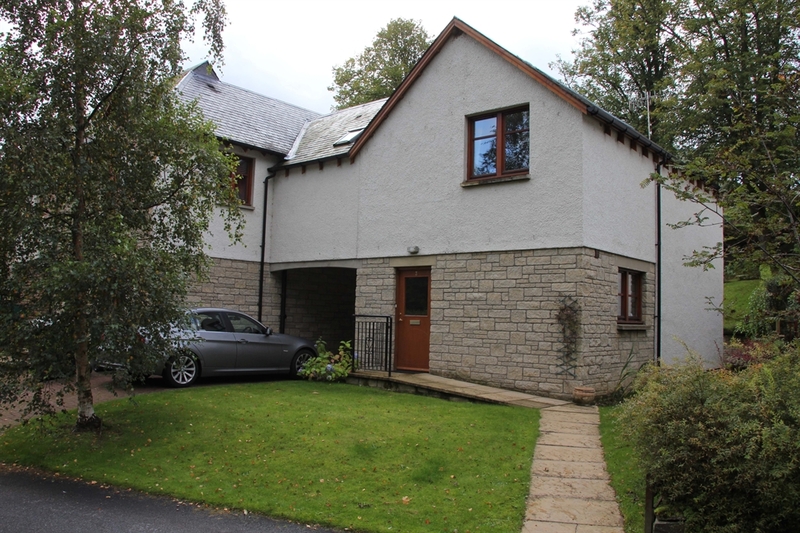 This comfortable, modern house is situated in a quiet private road on the western edge of the town of Aberfeldy in picturesque Perthshire. Weekly lets - Saturday to Saturday - are usual, but Short Breaks are available on request. Up to 6 people can be accommodated in the house, in three bedrooms. The master bedroom has a king size bed and an ensuite shower room. The second and third bedrooms have double and twin beds respectively and are served by a large family bathroom. All bed linen and towels are provided. Downstairs, the kitchen is fitted with a gas hob, electric split level double oven and grill, fridge, separate freezer, microwave, dishwasher and breakfast bar. The spacious lounge/dining room is equipped with colour TV, DVD, hi-fi and electric flame effect fire and leads to the conservatory/sunroom, utility room and WC/cloakroom. The utility room is equipped with a sink, washing machine, tumble dryer and ironing facilities and, with walkers particularly in mind, has ample space for drying of wet clothes and boots. The property is fitted with double glazing and has gas central heating throughout. The conservatory/sunroom leads to a patio and garden with garden furniture. Off the road parking is available for two cars. A picnic set is available for the use of guests. Aberfeldy is an ideal base for exploring the beautiful Central Highlands of Scotland and has a good selection of shops, restaurants and cafes within walking distance. The River Tay is some 100 metres from the front door of the house offering fishing and canoeing, whilst boating is available at nearby Loch Tay. Perthshire offers stunning Highland scenery, castles and natural history and the surrounding area is a paradise for walkers of all abilities - including easy riverside walks, the famous "Birks of Aberfeldy", the Rob Roy Way and classic Munros such as Ben Lawers and Schiehallion. Wildlife is prolific and regular sitings include red squirrels, roe and red deer, ospreys at nearby Loch of the Lowes and other numerous bird species. Aberfeldy has an 18 hole golf course and two other 18 hole courses nearby. For children and adults alike, there is a leisure centre with tennis courts, gym and a swimming pool. At nearby Pitlochry, the Festival Theatre offers plays and concerts all year round. Enjoy the comfort of 3 The Beeches and sample the best that the Central Highlands can offer!